Turbocharger undergoing overhaul Turbo shortly after being moved into the container for restoration and overhaul. The new metal work bench purchased off e-bay, and the engine hoist and forklift have proved essential for working on items of this size. At this stage only external cleaning had taken place. 28th February 2010. 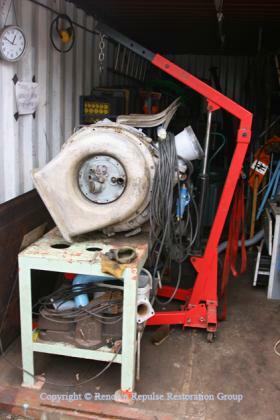 Turbo shortly after being moved into the container for restoration and overhaul. The new metal work bench purchased off e-bay, and the engine hoist and forklift have proved essential for working on items of this size. At this stage only external cleaning had taken place. 28th February 2010. Armature of newly acquired ETH generator In February 2010 agreement was reached with a fellow 50 owner to acquire a surplus Auxiliary/ETH generator set. Our existing one earmarked for Renown requires expensive repairs so it made good sense to acquire a better condition one. The new acquisition is in a dismantled state but is complete and undamaged. It does have a defect within the auxiliary armature but this was rectified by swapping for an identical ex-Class 37 aux gen. The new ETH/aux set is halfway through an overhaul but work was stopped and its condition had since deteriorated slightly. The displaced Aux/ETH will be retained as a future spare knowing how temperamental and scarce these machines are. 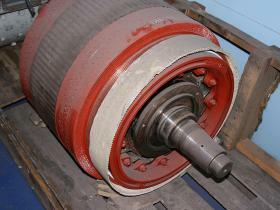 This view is from 4th September 2009 and shows the excellent condition of the ETH Armature, unfortunately three years storage (undercover) has resulted in deterioration of the bearings which will need replacing when the machine is overhauled. In February 2010 agreement was reached with a fellow 50 owner to acquire a surplus Auxiliary/ETH generator set. Our existing one earmarked for Renown requires expensive repairs so it made good sense to acquire a better condition one. The new acquisition is in a dismantled state but is complete and undamaged. It does have a defect within the auxiliary armature but this was rectified by swapping for an identical ex-Class 37 aux gen. The new ETH/aux set is halfway through an overhaul but work was stopped and its condition had since deteriorated slightly. The displaced Aux/ETH will be retained as a future spare knowing how temperamental and scarce these machines are. This view is from 4th September 2009 and shows the excellent condition of the ETH Armature, unfortunately three years storage (undercover) has resulted in deterioration of the bearings which will need replacing when the machine is overhauled. Excellent condition field windings of new aux gen The picture above shows the excellent condition of the auxiliary generator field windings as seen on 4th September 2009. 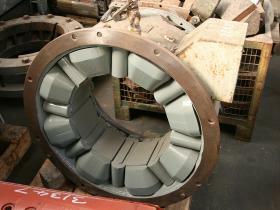 The picture above shows the excellent condition of the auxiliary generator field windings as seen on 4th September 2009.